Not having flown for about 10 years, this trip around the pattern was absolutely terrifying. Actually....I did fly, a few hours earlier I got about 45 minutes in Mike Wassmann's Cessna 172 to determine if I remembered how. There was no trouble at all with the Cessna, and I figured I had it made! Ha! The second this Quicksilver took off, it leaped about 100 ft into the air. Let me tell you these Quicksilvers are HOT performers. They are a rocket and there is simply no comparision to any airplane I have ever flown. When flying, there is really not much reference except my toes out there. The wing is not in the line of peripheral sight, at least not with a helmet on. So it feels like a flying chair! After I landed, I was just going to park it for another day. But I started thinking...."if I chicken out now, I am going to be even more scared tomorrow. Conditions are perfect. Lets go again..." and I took off for a second trip around the pattern. This one was also uneventful, although I was no less terrified! At least, I found that I could overcome my fear, and in subsequent days and weeks I have come to accumulate some hours. Have to admit, though, I still do not feel totally at ease. 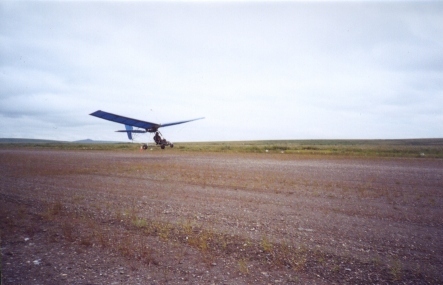 Trust me...an ultralight is most definetely NOT a plane, at least where psychology counts! Note added in the fall of 2000. I logged 15 hours of Quicksilver ultralight in the Summer and Fall of 2000. No incidents or anything except fun. That is, when I was not terrified. These Quicksilvers steer strictly with the rudder pedals, they have no ailerons. This makes it for less than perfect control, and it can get very exciting when landing the thing on a narrow trail, or when the wind is gusty. The Quick was parked outside when a 50 mph wind hit this fall. It caused some damage to the right wing and possibly other parts of the structure. Because of this, I have decided to rebuild the wings in the fashion of the BRICK. This will entail clipped wings, with 28 or 30 ft span instead of the present 32 ft; ailerons; and less dihedral angle. This will make this Quicksilver functionally equivalent to the current production Sprint MX. I also have plans, but rather vague at this time, to lengthen the tail; that is, lengthen the longerons so the tail is farther away from the wings. This should give more elevator authority. This modification is "in the design stage only." Stay tuned! 2001 note: due to business pressures and other personal factors, I was unable to work on the Quick this year. All plans are postponed until 2002. 2002 note: Keith also damaged his Quicksilver, and I decided to give him mine. That way he can put all the parts together and make a fliable one for himself. I will wait for a subsequent year to get flying again.